I know it may seem a bit early to be setting up a fall tablescape. Well, not for me! I love this time of year and I love creating new, inviting spaces throughout the season. 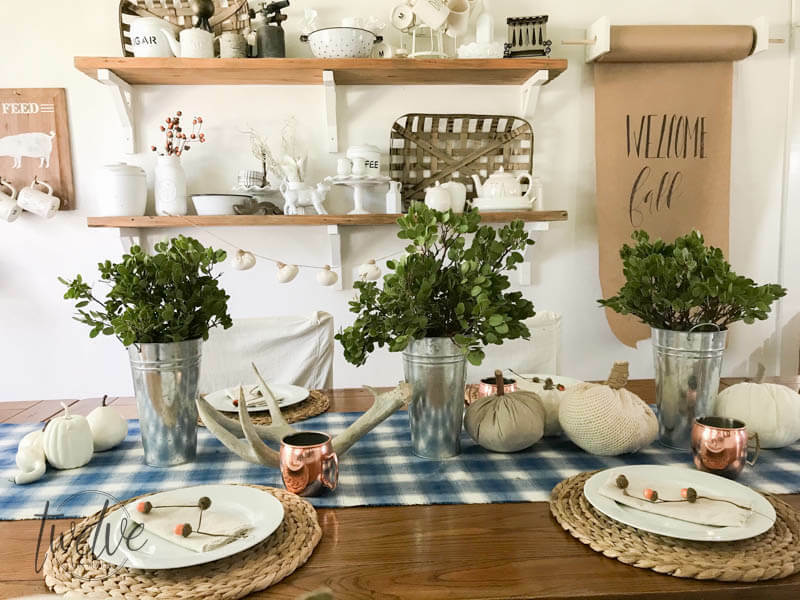 I am excited to be participating in a tablescape bloghop, and its all about fall! (Make sure to check out the end of the post where all the other blogger links are!) Since it is a bit early still, I thought I would use the resources around me, and create an early harvest tablescape. 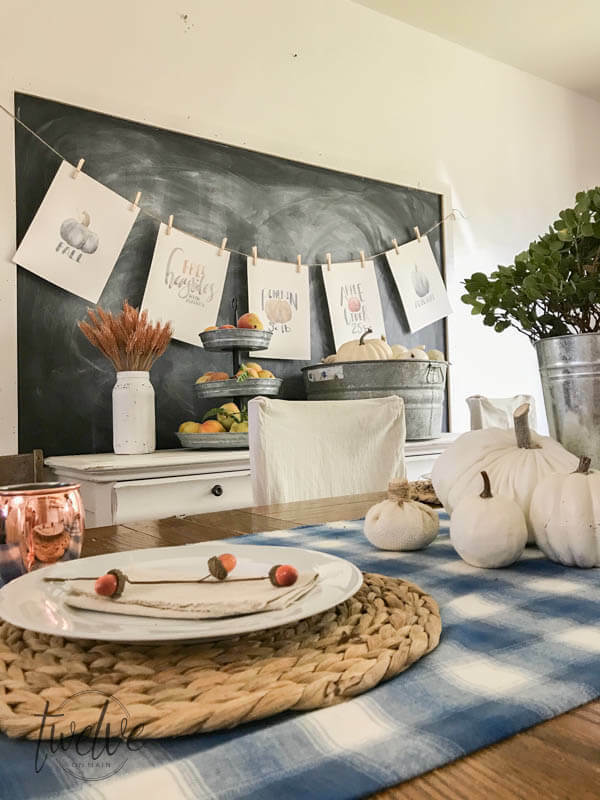 When I mean harvest tablescape, and using the resources around me, I really mean it. This time of year, we are having a bounty in the garden, and all of the foliage is just too beautiful to ignore. I find that we spend much of our time this time of year working, preparing and getting all of our harvest ready for the winter. 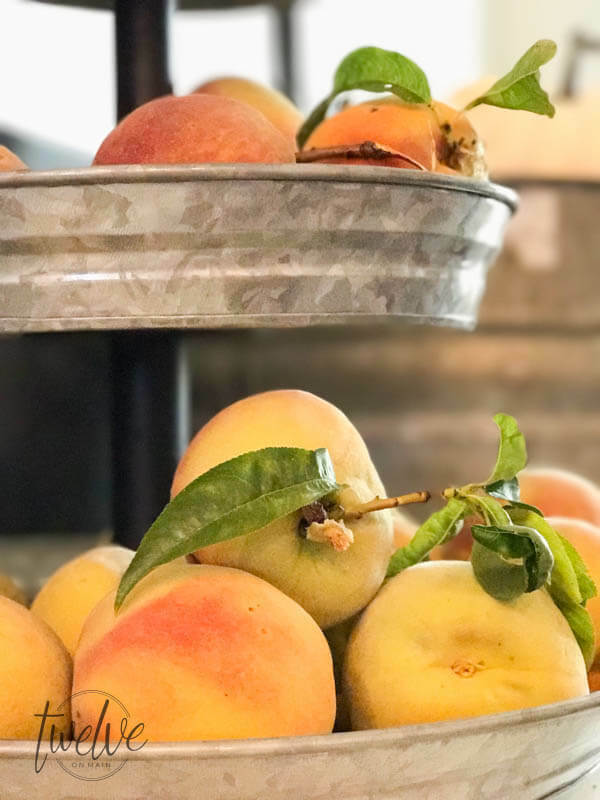 Our peach trees are stripped of their fruit, our tomato plants are just getting ready to bear red ripe fruit, and our corn, is days away from being on our dinner table. 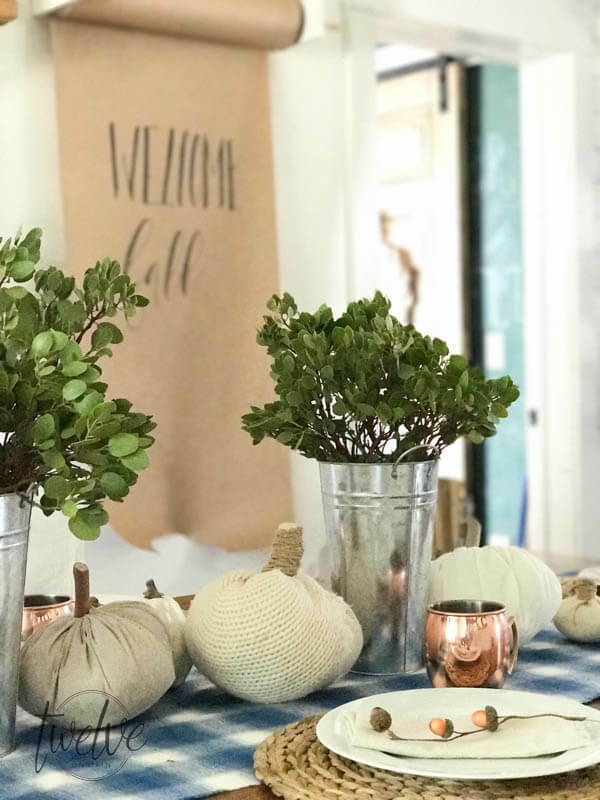 So I wanted to include a few of my fall elements in my early harvest tablescape. I also wanted to let you in on a little secret. 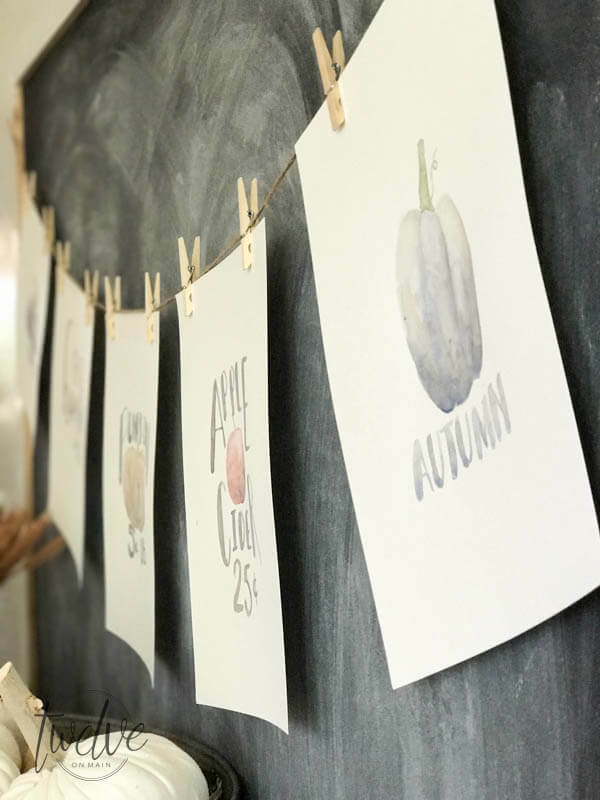 Over the past few weeks, I have been working away on some pretty great fall printables. 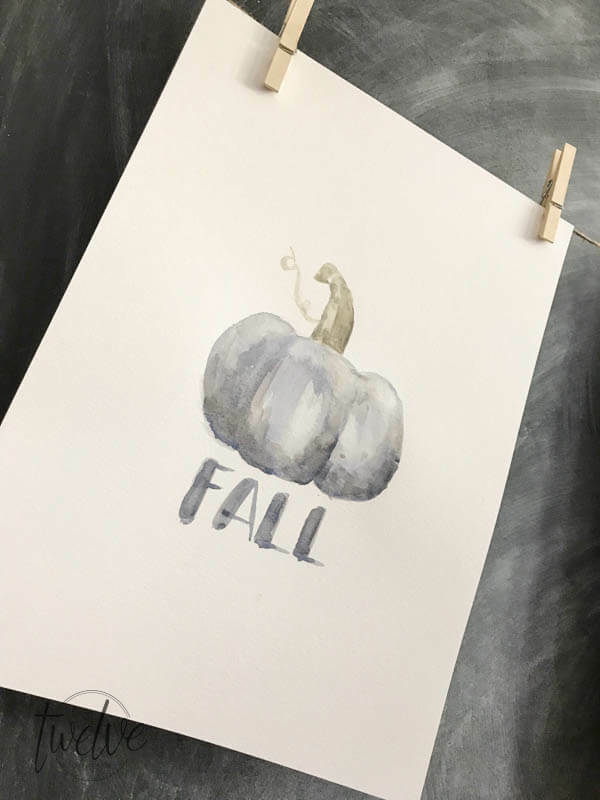 I have been looking, and searching, and well, just coming up empty when it came to finding some fall printables that had a soft, organic feel to them. 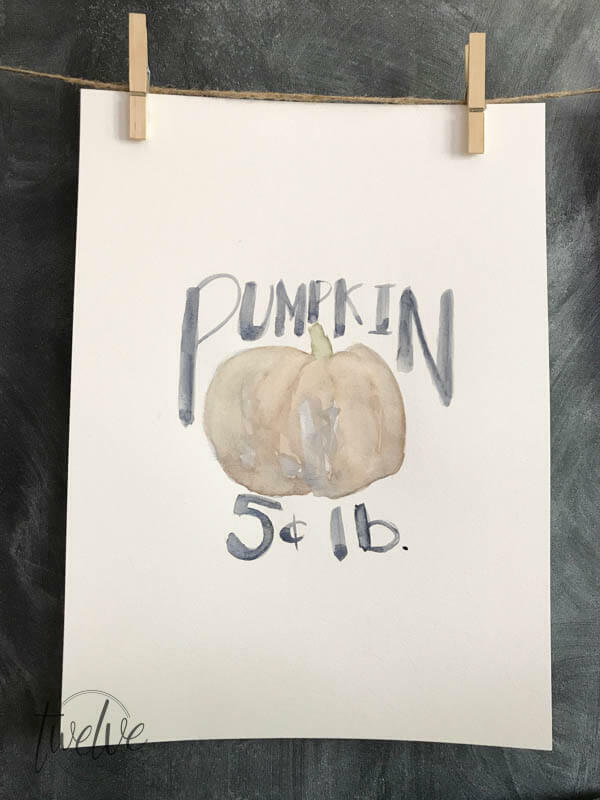 Something that would looks perfect in a farmhouse style home, or any home where you may want a muted or soft look. This year, in many of my home tours, including my spring tour and summer tour, I have been obsessed with adding touches of blue to the space. This fall, it is no different. 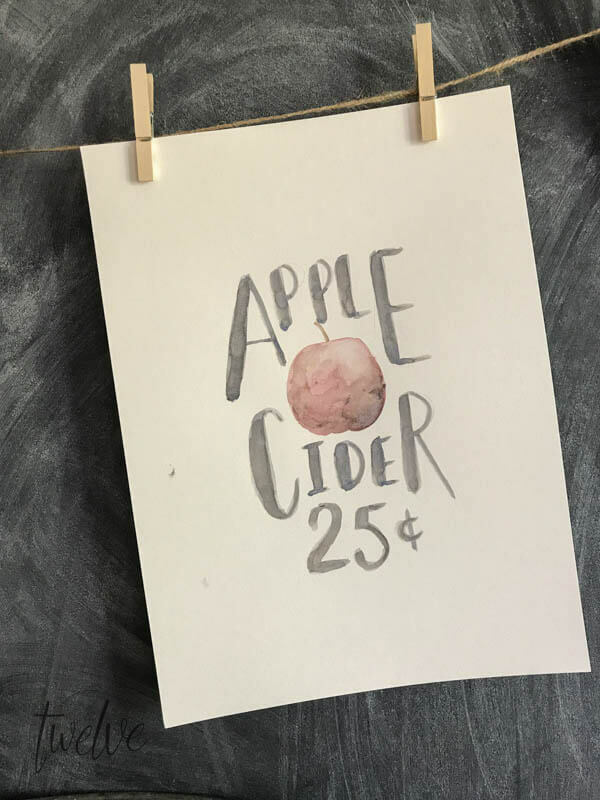 I feel like I was able to create some pretty great watercolor printables that not only look great, but incorporate a little bit of that blue/grey hue I am loving lately. Here is a sneak peek! You can see more throughout the post. 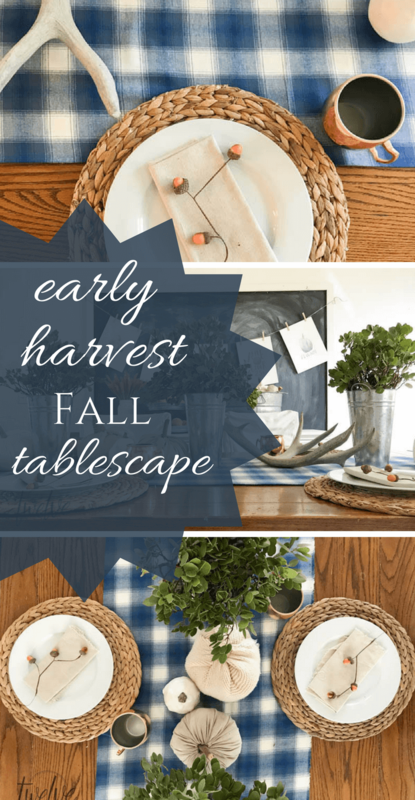 Get the Early Harvest Tablescape Look! I have those printables available at the end of the post if you are interested! My inspiration for the base of this table was the plaid fabric. I have currently been working on 40 centerpieces for a hospital foundation dinner, and I really wanted to work a late summer vibe into the centerpieces. This fabric is the anchor to the centerpieces. and I kind of fell in love with it, so I went and snagged my own from Joanns Fabrics. Since the more bold blue fabric was used as the base, I wanted to keep the rest of the table soft, and raw. 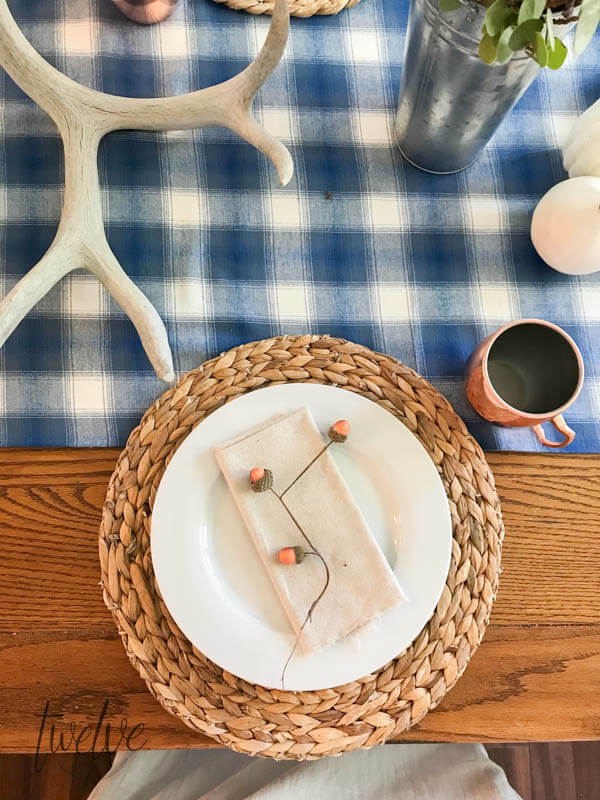 Using my seagrass plate chargers in this harvest tablescape, it adds a lot of texture to the table. Once the seagrass chargers were in place I added my favorite white dishes from Amazon. I added some raw dropcloth napkins(strictly for decor) to the top of the plates and topped that off with a sprig of faux acorns. Instead of plain cups though, I added my copper mules to the setup. I love the pop of glamour and color they give the table. One other element I was inspired to use is the foliage in the centerpiece. I want to focus on some specific elements in this space. 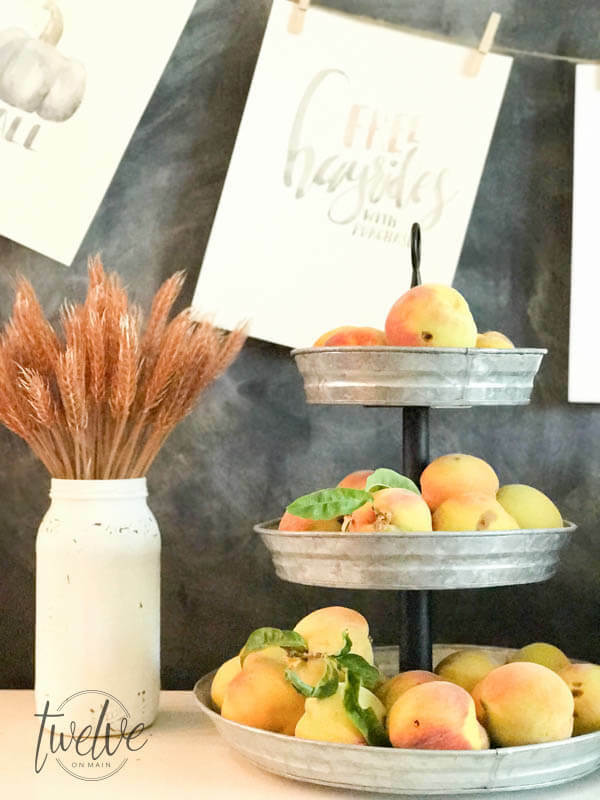 Galvanized metal, natural elements, and vintage farmhouse style. Around our area, we have this underbrush called Manzanita, which means little apple. It is the most interesting plant. We used it last year in my sisters outdoor wedding in a big way. I remembered how durable it was. It stayed fresh for so long, and the leaves never wilted. I think it is a perfect thing to add to your decor, since it lasts so long. 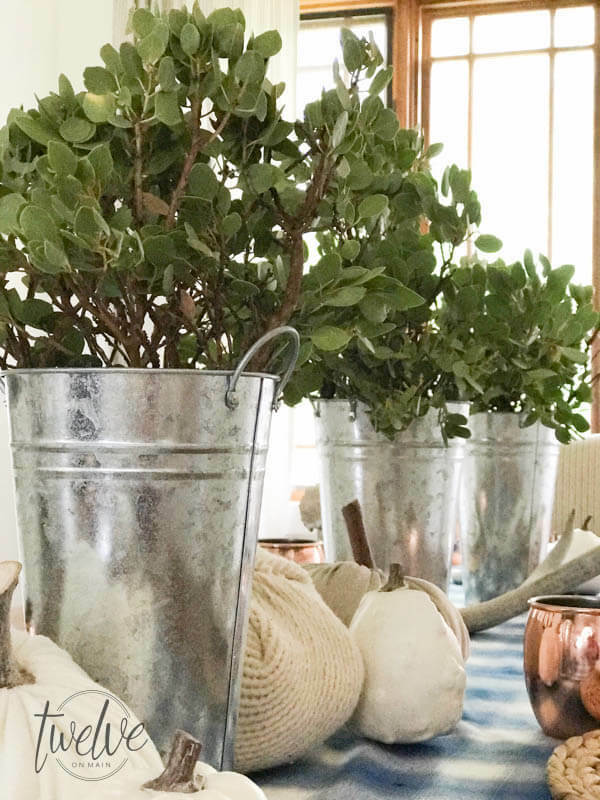 Three galvanized containers full of Manzanita is the center of my early harvest tablescape. 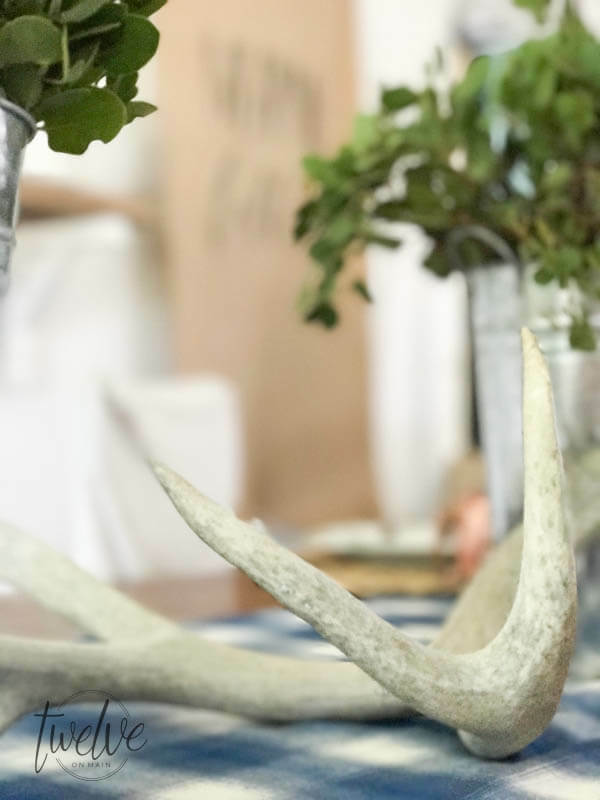 It was time to add some simple features including my DIY fabric pumpkins, and some of my very own antlers. Decorating a table doesn’t have to be complicated and overwhelming. I wanted to continue the look over to the hutch on my wall. Up next came this large galvanized tub , which I set on the top of the dresser, overflowing with all sorts of pumpkins. Since it is about impossible right now to get real pumpkins, I used a lot of my faux pumpkins that I have gathered over the years. Next, to add my galvanized tiered tray to the hutch and filled it full of our very own homegrown peaches fresh off the trees. Now, I wish we could use smellivision, because the room smells so amazing with all these fresh peaches! Its a simple way to add some seasonal decor, that is multi purpose. How great is it that you can eat your decor! I think its pretty awesome. I am really so happy with how this early harvest tablescape turned out! As many times as I have created fun and unique tablescapes, it is amazing how different you can make them with just a few simple adjustments. I whole heartedly believe in using the items you already have. Shop your home. This is what I did for this early harvest tablescape. The only thing I did purchase for this was the fabric for the table runner. Start with one main focal point, whether it be a piece of fabric, or a great painting, or even a set of flowers or container. Use this as a jumping off point for the rest of the space. 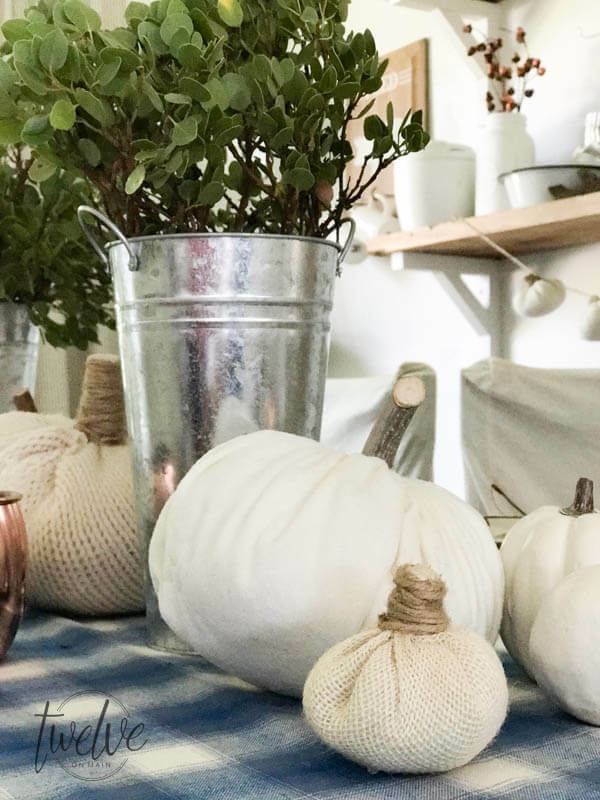 Mine is the fabric, and now the combination of the galvanized metal tubs and containers, along with my neutral pumpkins, nature inspired elements, and those peaches…oh those peaches. 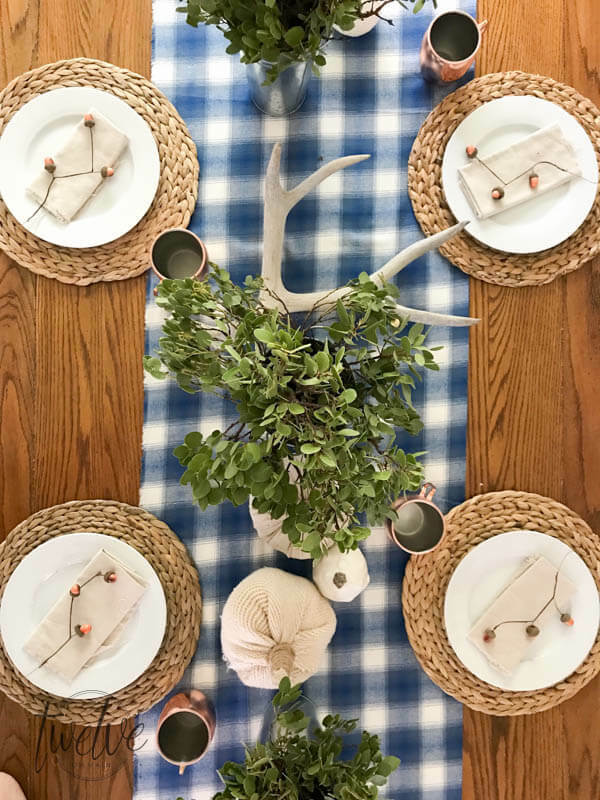 It is currently my most favorite tablescape, and I can’t wait to sit down with my family and spend a little time together enjoying more of our yummy garden harvest. 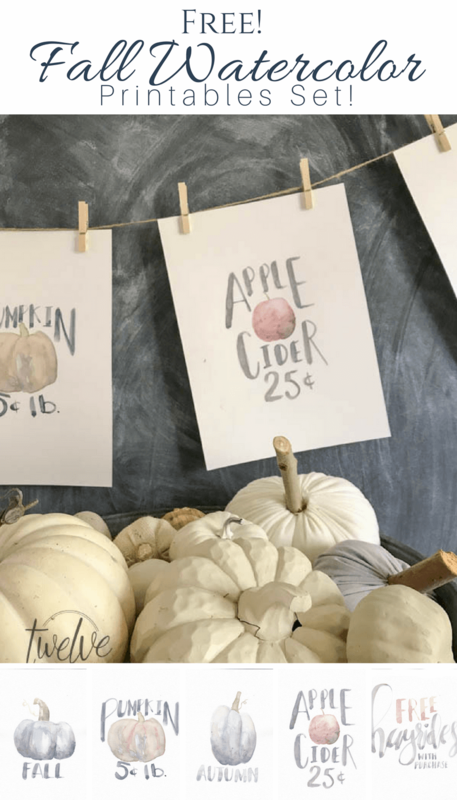 Now, what do you think of these fall printables? 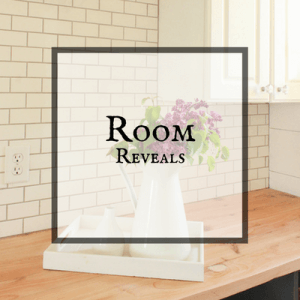 This set of printables began with the thought of only one, but as I continued, I was pleasantly surprised to see that I was creating a set of printables that would look so awesome together on a wall! 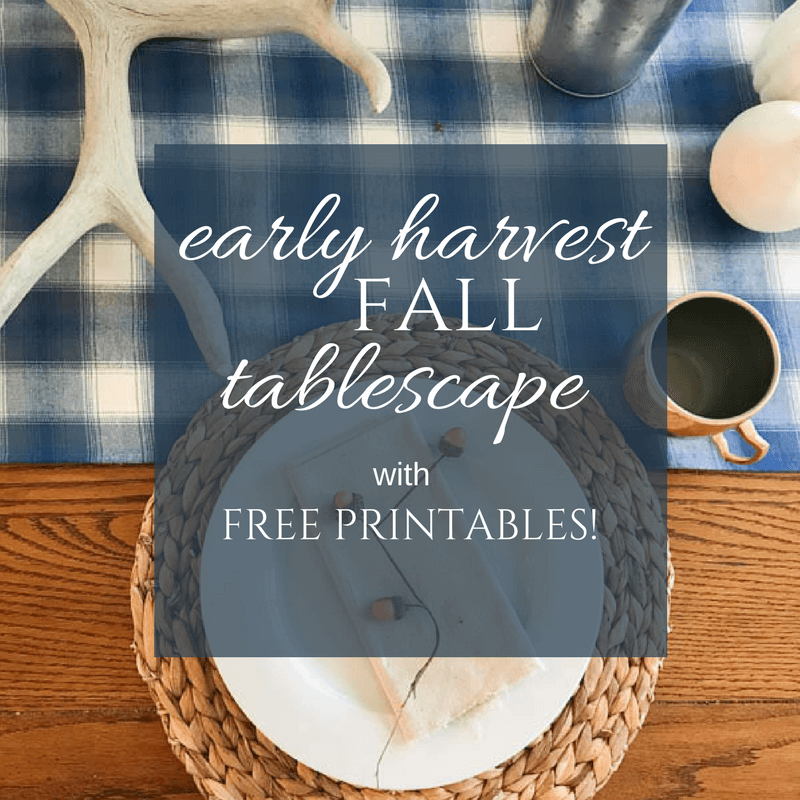 My early harvest tablescape is not complete without these fall printables! I really hope you like them! 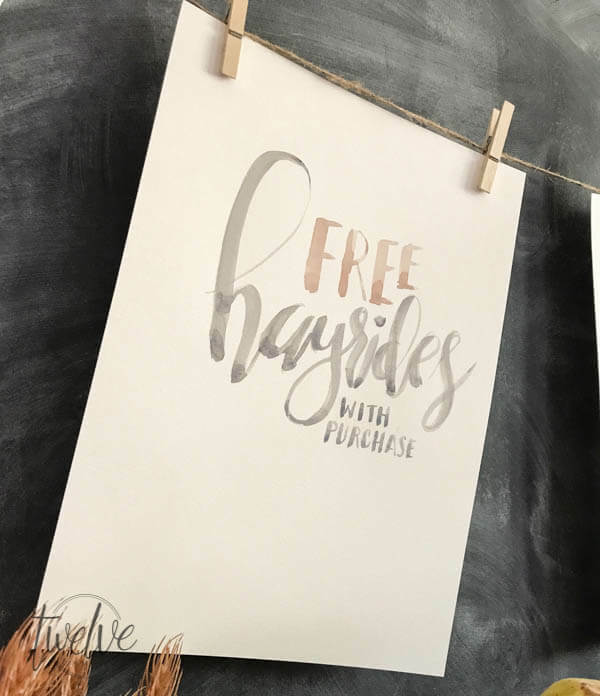 You can click below to download the file with all 5 printables. 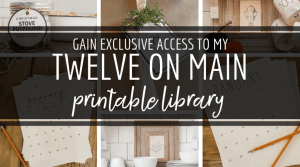 Get access to my printables here! Do you want to create a similar early harvest tablescape, or want something you’ve seen in my dining room? This post contains affiliate links for your convenience. Just click on the arrow to see more, and click on the image to be taken directly to the product! Each one of these printables is from a hand painted original by me, with much care and love. I hope you thoroughly enjoy them, and share them with all your friends! PIN them, share them on Facebook! Whatever floats your boat! « 10 DIY Fall Wreaths to Make Today! Hi Sara….your tablescape is charming. I like the addition of blue on your table runner as it makes the other colors of your tablescape blend beautifully. Great job. Sara, I enjoyed your bio and applaud you for your resourcefulness and creativity. 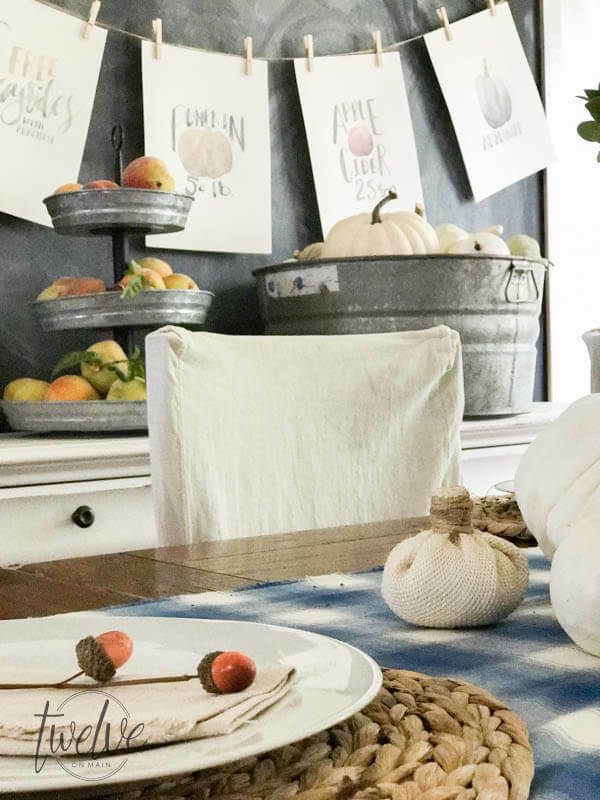 Your fall farm house tablescape and dining room decor is soft, subtle and inviting. 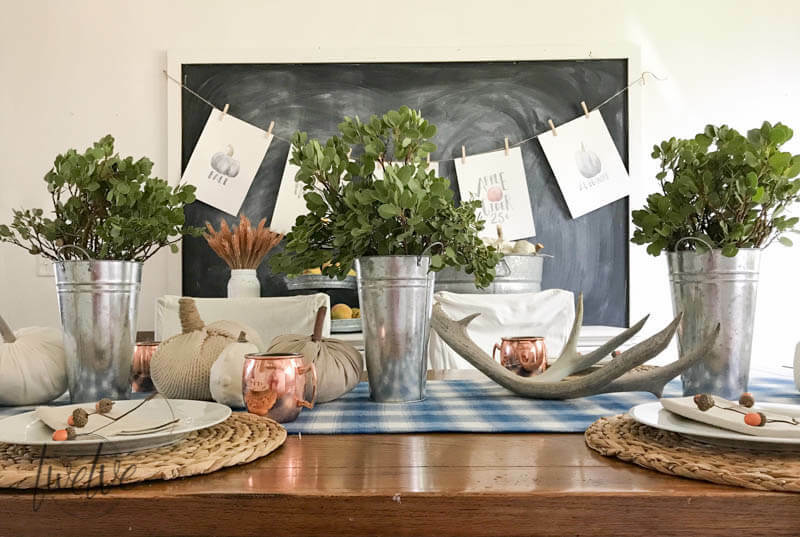 I love your blue runner and galvanized cans with greenery, antlers,soft handmade pumpkins in neutral tones with copper touches as well as your plate stack.Darling acorn topping your plate. 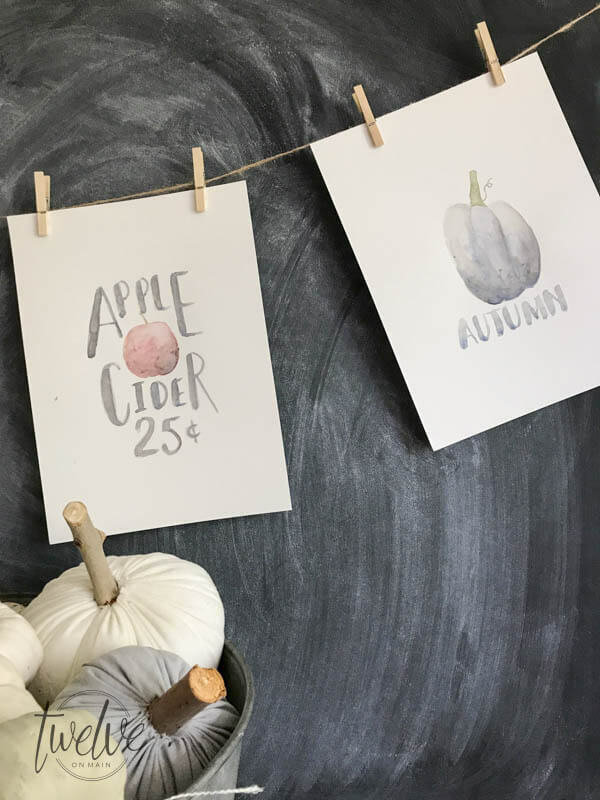 Great artistic printables. Including your children in your creativity will reap many rewards. What a great family portrait. I can taste your peaches. Our local ones were not good this year because of the abundant rain and they were sorely missed. I enjoyed participating in this bloghop! 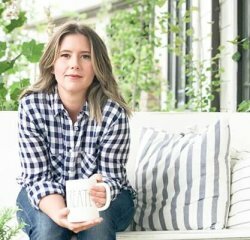 Sara, such a beautifully presented farmhouse table. I love every element so carefully thought out. Using what we have is refreshing for others! The printables are so cute and add so much charm. 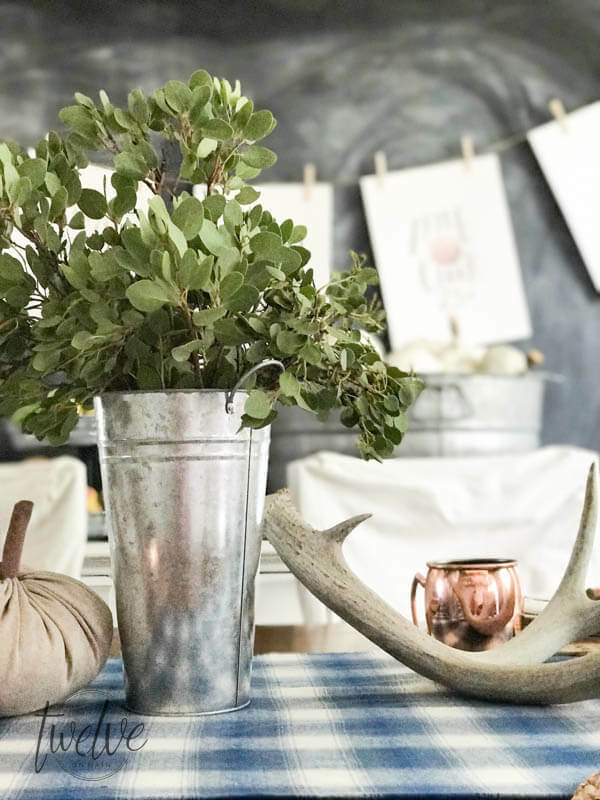 The galvanized buckets filled with manzanita is the perfect centerpiece with faux pumpkins and antlers. I can smell the peaches! Your printables are just lovely and your elegant simple table is gorgeous! What a stunning tablescape! I am so impressed with all of the elements you combined to bring your table to life. I haven’t used blue in my home for 30 years and am now using it throughout my home. I love the raw drop cloth you used for napkins, I don’t know why they couldn’t actually be used. 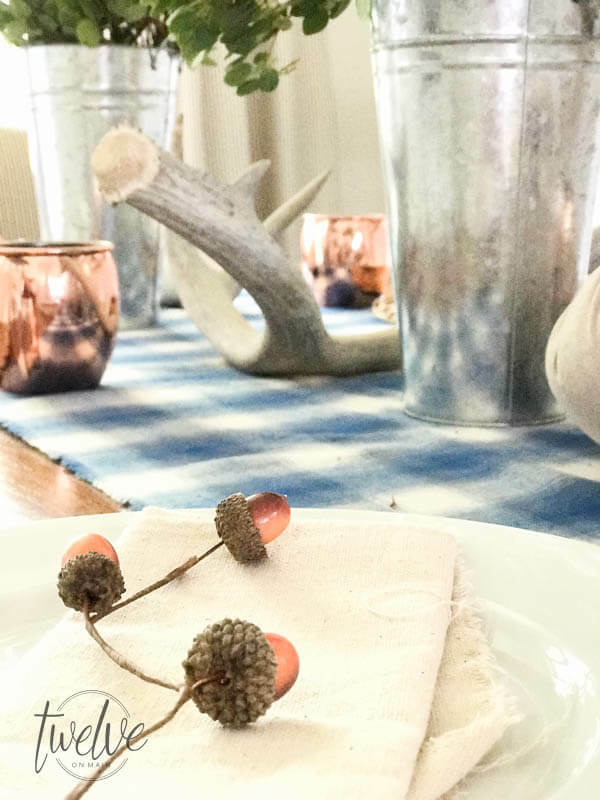 The simple acorn adornment on each napkin carries through your simple but statement making tablescape. You pulled it all together so very well! I especially like your roll of paper in the background with your Welcome Fall message! 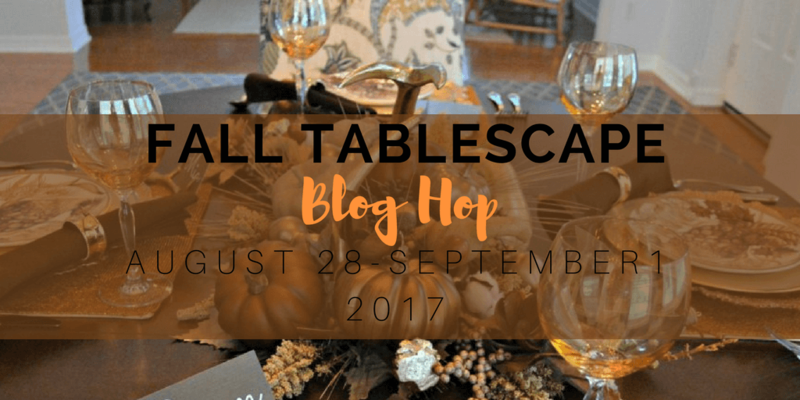 Thank you so much for joining the tablescape blog hop! Sara, I can’t believe how many of us are using copper accessories in our tablescapes. Your mugs look great with the the blue checked table runner. 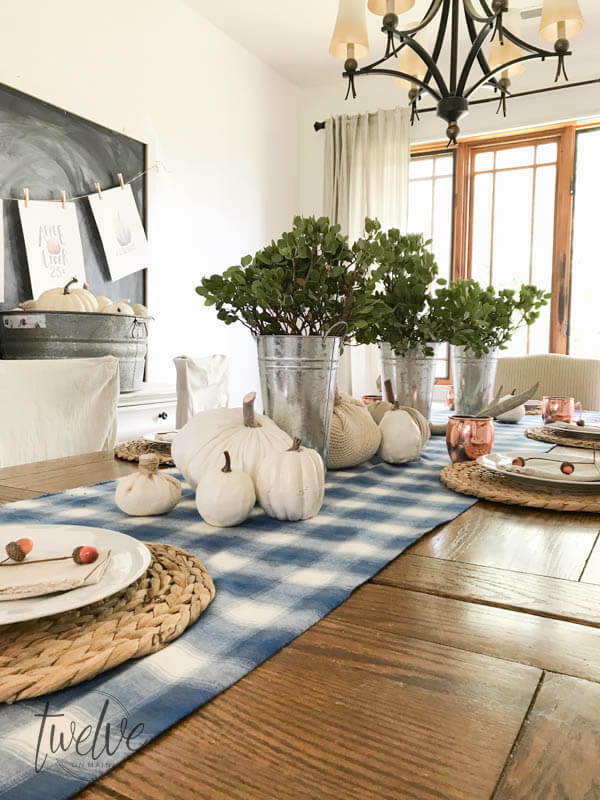 The tall galvanized pails as centerpieces and big one as a tub for pumpkins pair so nicely with the matte, rustic feel of the placemats, horns, and napkins. 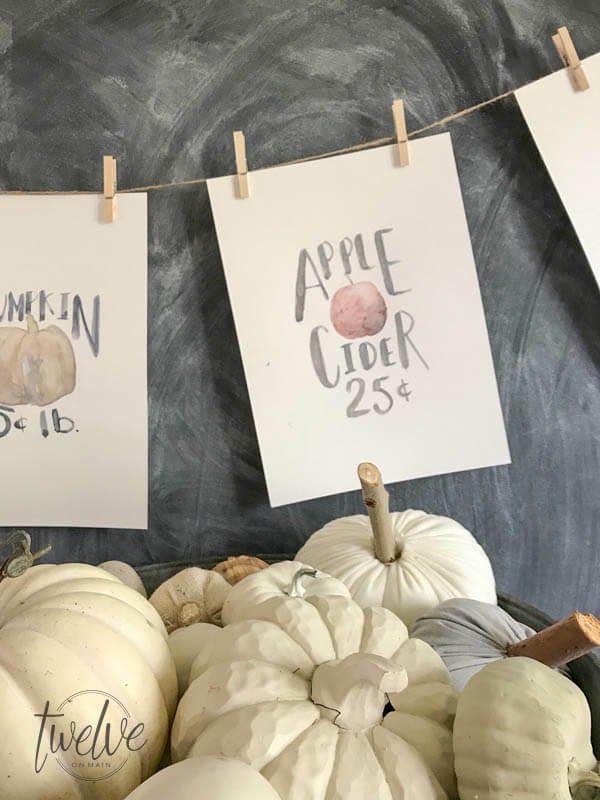 Thanks for the pretty fall printables. The blue/gray combo is so pretty and soft. I love how you conveyed the autumn/harvest feel without using the traditional color palette. Thank you for the printables and for this lovely table. Thanks Sandra! That was my goal! Thanks Cecilia! Have a great day! That plaid fabric really caught my eye as well! 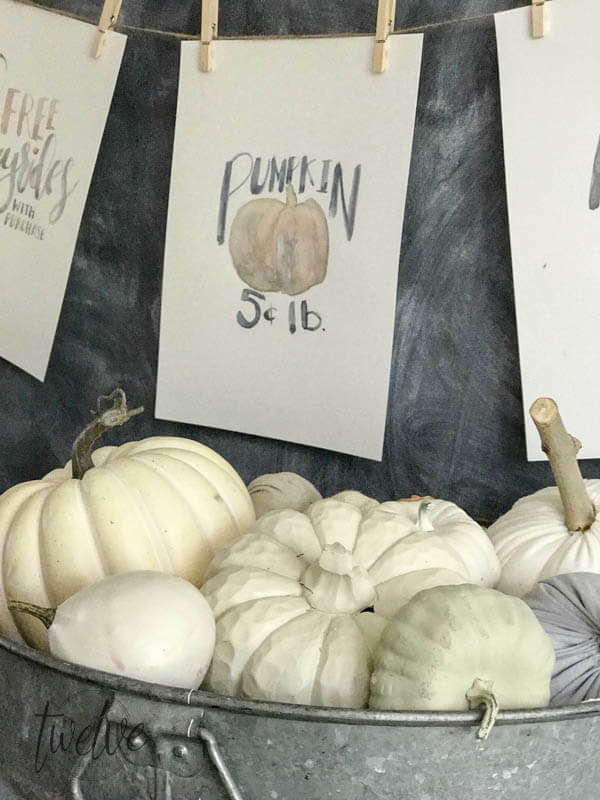 It is the perfect backdrop for the beautiful collection of neutral pumpkins. I love all the layers of texture, colour and materials both on the table and your sideboard! 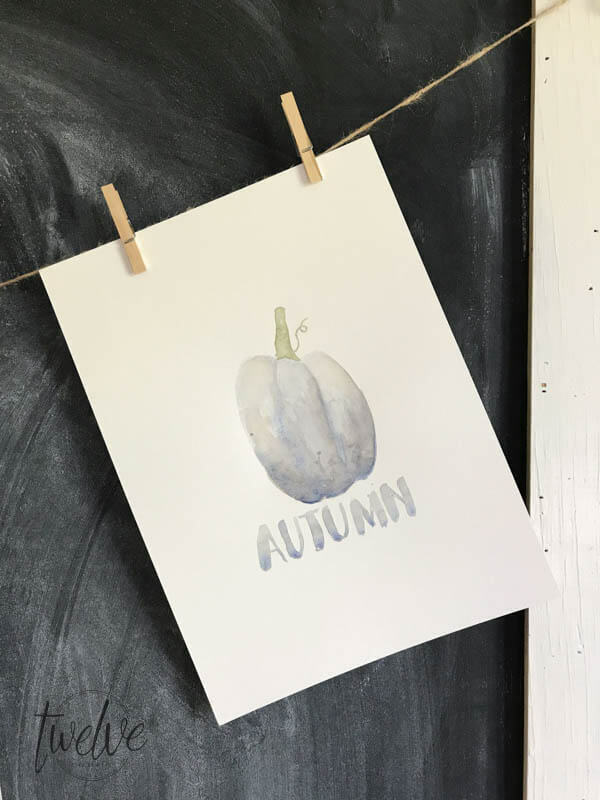 Oh, and those printable……gorgeous! Sara, you go girl. I love the fact that you shopped your home almost entirely for this table. Very nice in its simplicity. I love my dropcloth tablecloth and napkins I cut, and get so much mileage out of them. Your printables are a bonus for readers. Lovely tablescape filled with rustic elegance. Natural elements make for a cozy comfortable table. I love shopping the house for things. Very creative napkins as well. A lot of us must be on the same page, using those copper mules. Isnt that funny? Copper is quite the lovely accessory! Great minds think alike! This tablescape has an understated fall “essence” to it that I just love! 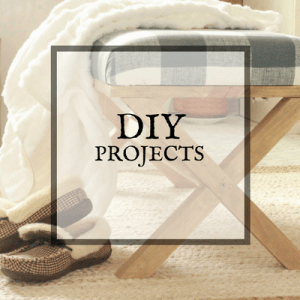 That blue plaid runner is perfect mixed with the white tones and copper mugs. I’m a big fan of the antlers and the woven chargers as well. Your table is so inviting and just says pull up a chair and relax over dinner – the best kind of vibe there is for fall! 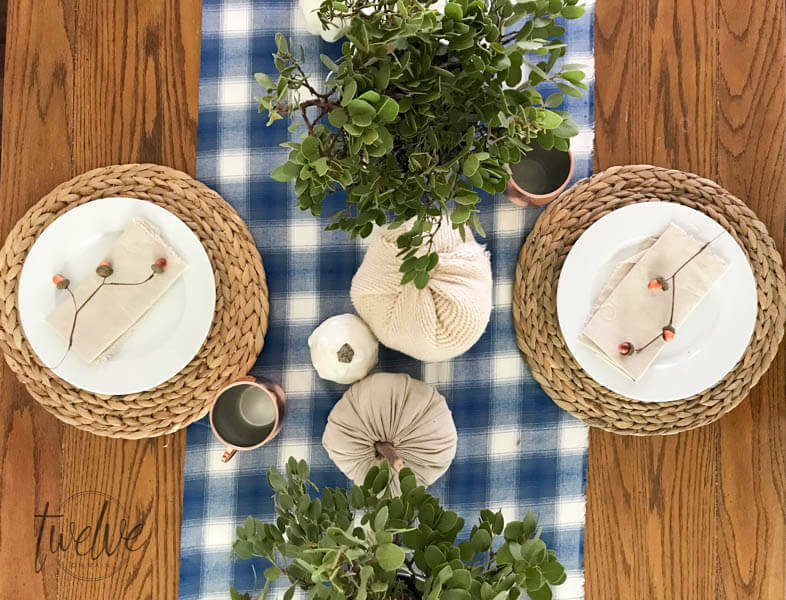 Beginning with the plaid runner and ending with copper, your table is so inviting and lovely, The manzanita is perfect in the galvanized pails, and I love the glimpses of your beautiful home. Thank you for sharing the beautiful fall downloads ???? my favorite…….the pumpkins! At first glance I thought they were real! Please do share how you made them! Please do visit SupperTableTalk on Friday! Thank you! Which pumpkins are you referring to? The ones on the table or the ones in the bucket? Such a beautiful country style tablescape! ! Love the blue touch and little faux acorn decoration ! 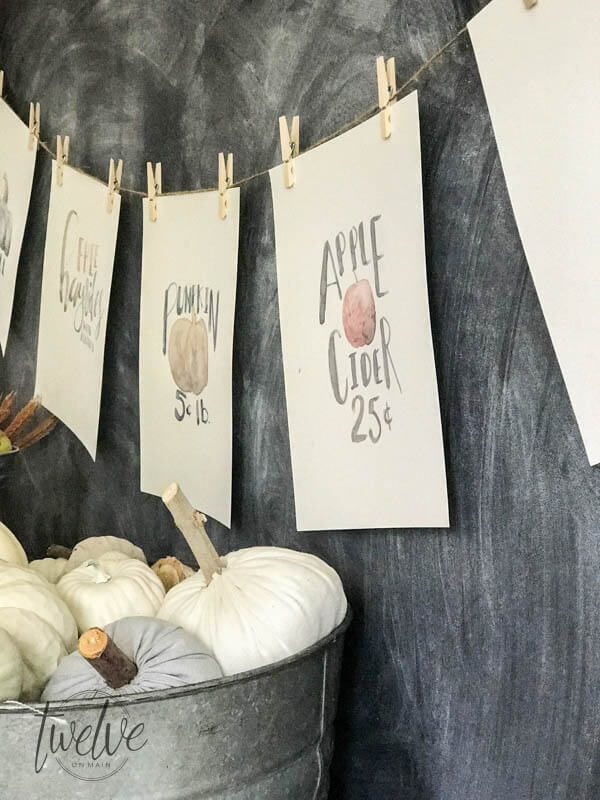 Your printables make the perfect harvest garland strung across your chalkboard! I love anything galvanized and Manzanita too! I love the blue table runner so much. Now, after I have been seeing so much beautiful blue colors this year, I wish that I had purchased more blue items. To bad I removed all the tags already. You entire home is so beautiful! I’m a fan! This table is so beautiful. I am totally crushing over that pretty blue check runner and your mix of textures and natural elements. The stand with the peaches is stunning. I think that decorating with fruit is such a wonderful idea. Lets just say that I am loving everything about your table. It was a pleasure joining you on this fun blog hop. So happy to be taking part of the blog hop with you, your table is stunning! Your table is stunning! I love everything about it…the blue and white runner is striking and I love how you incorporated the blue color with other fall elements. I also love all of the galvanized metal accents- so farm-housey pretty! Thanks for sharing your talents with us on the blog hop this week! Love your mix of textures on this tablescape. 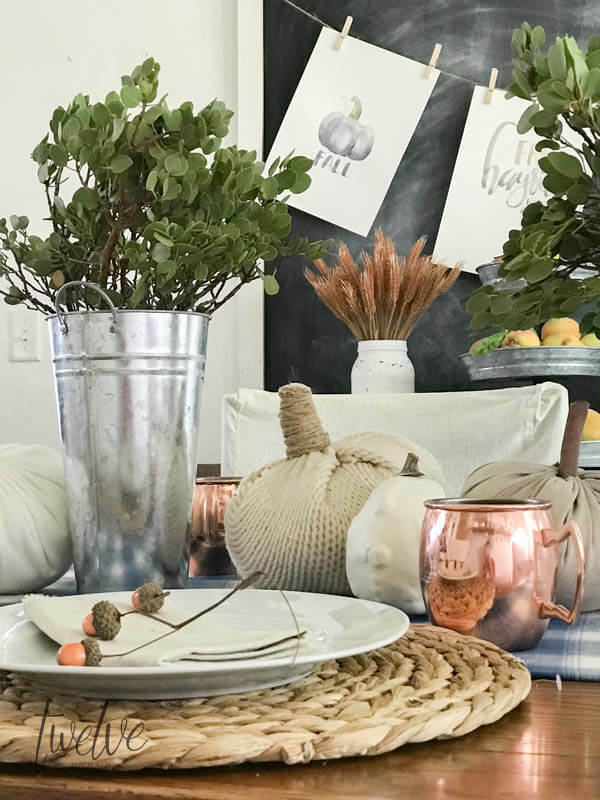 The smooth shiny copper mugs, the chunky rattan of the chargers, and the drop cloth napkins. It all looks so pretty on the background of the blue checked fabric. Well done! – Twelve On Main <Liked it!